The CNC Version of Mozaik™ is the complete package. It has all the features of Mozaik Design, Mozaik Manufacturing, Mozaik Optimizer, as well as the ability to create machine ready G-Code. 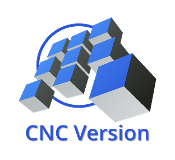 The CNC Version takes you from the design to your CNC Router with ease. All Mozaik products are sold via subscription. Initial subscription period is 90 days. After 90 days, the subscription will automatically renew on an annual basis. Your credit card will be billed for the first months subscription immediately. Future monthly billings will begin one month after the software has been downloaded.